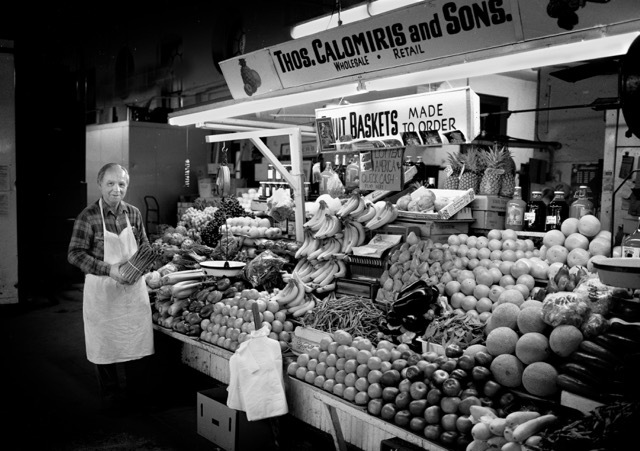 Chris was born on Capitol Hill (at 221 First Street NE) across from the Russell Office Building, attended Peabody and Stuart Junior High schools, left briefly to serve in the Pacific during World War II and returned to join his father, Thomas, at the New Center Market at Fifth and K Strreets NW, where his father had moved when the Old Center Market (site of the National Archives) was torn down. In 1963, the New Center Market became the Wax Museum and 12 of its merchants moved to the then abandoned south end of Eastern Market. Chris was one of the 12. Chris and his wife are as familiar to Eastern Market shoppers as each of their children (Zoy, Thomas, and Leon) have been following a true family tradition. NOTE: Chris, Maria, and Leon Calomiris have all been interviewed by the Overbeck Project; see All Interviews and click on the topic Eastern Market to find those quickly. One correction: Chris's birthplace is actually the current location of the Russell Senate Office Building, which did not exist when he was born across from the (Old) Dirksen Senate Office Building.